My aunt suggested I look into the Long Beach Pike. As of the end of 2007, the Looff carousel building, was rotting in a parking lot. 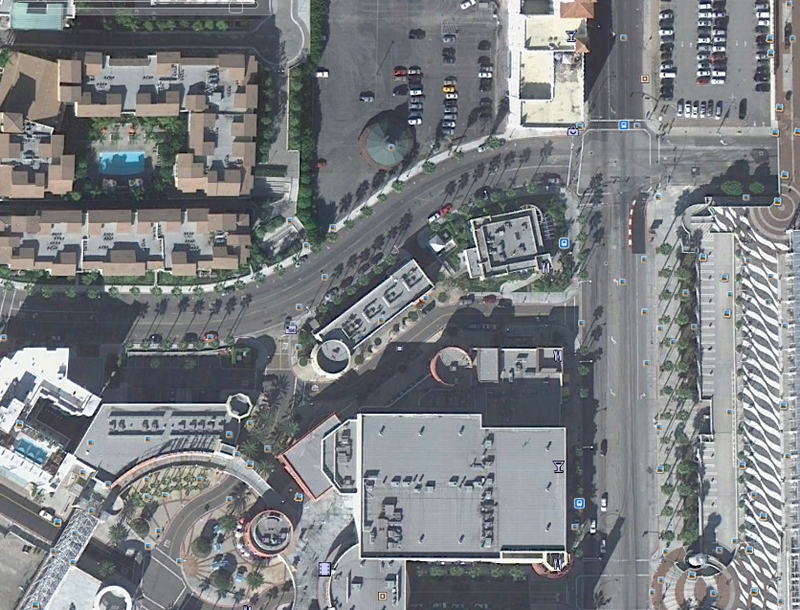 It appears they are going to move and preserve at least part of it. 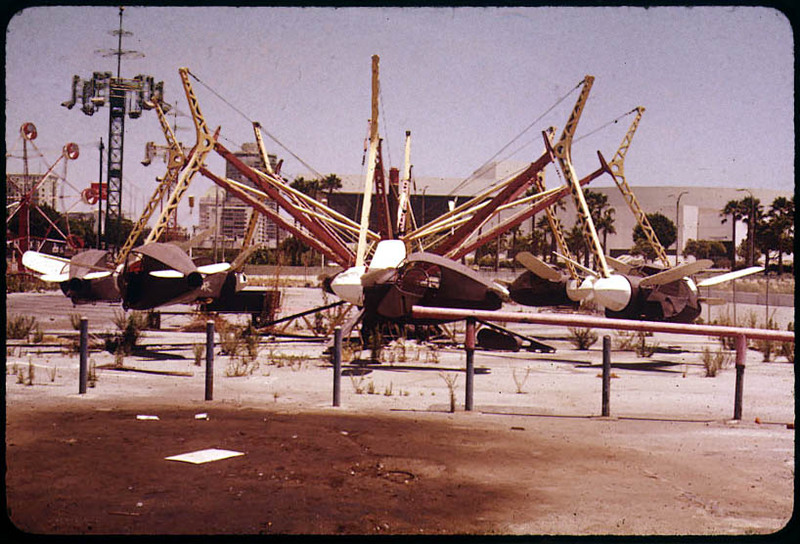 The Pike was an amusement park and arcade near the beach south of Ocean Boulevard in Long Beach, California. Started in 1902, The Pike ran until 1979, when a long-term contract with the city ran out. It was most noted for its large wooden roller coaster, the Cyclone, that extended out over the water. 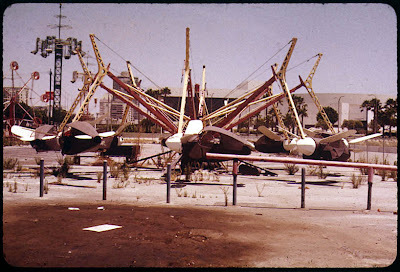 While surfing around, I found some interesting photos of the abandoned park and rides from the 1980s. View them here at Photos of the Forgotten. 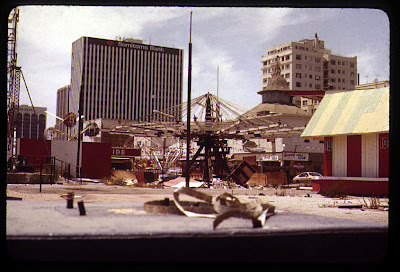 The site also has postcards from when the Pike was open. 2005: Looff carousel top can be seen in the parking lot. 2009: Looff carousel top can be seen in the parking lot. 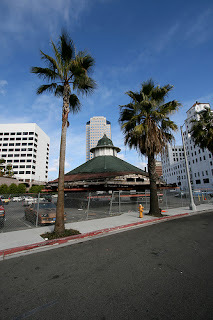 2012: The Looff carousel top is gone. Looking at Google maps, you can see Looff carousel building sitting in the parking lot to the north. 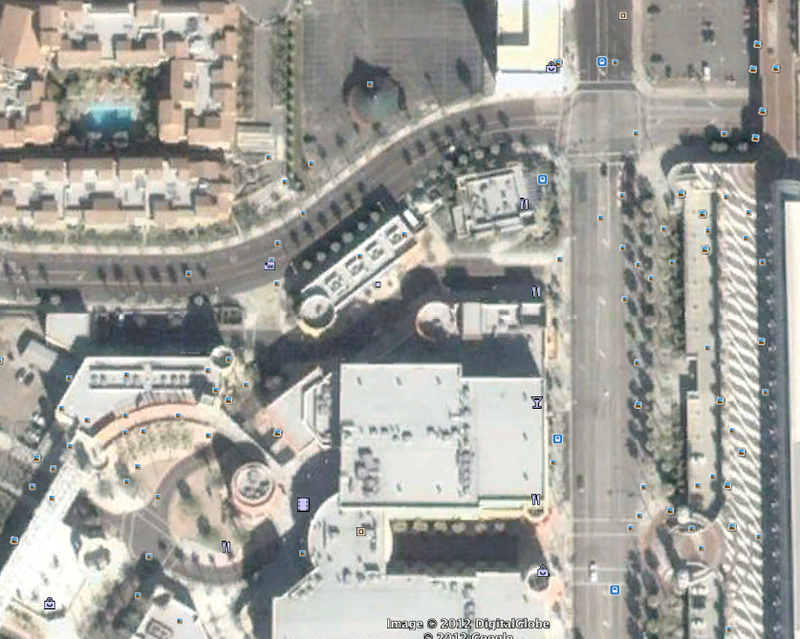 View it live on Google Maps. 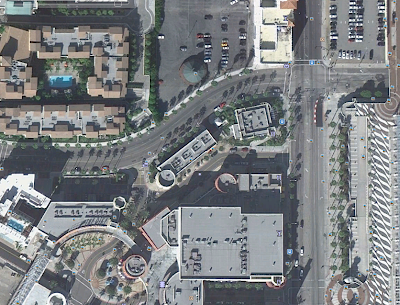 Obviously Google maps has not been updated recently. Here is today’s version of The Pike at Long Beach. Here are some other attractions from the Pike. The photos below and many more are can be viewed at Photos of the Forgotten. The city has dragged their feet too long on the Looff roof. They did a study recently and decided it was too costly to restore. So, no, there are no plans to preserve any of it. It’s protected only by yellow tape; anybody can walk into the parking lot. Long Beach has little regard for its history. Sad. I grew up going to the Pike with my family....I sure miss it. 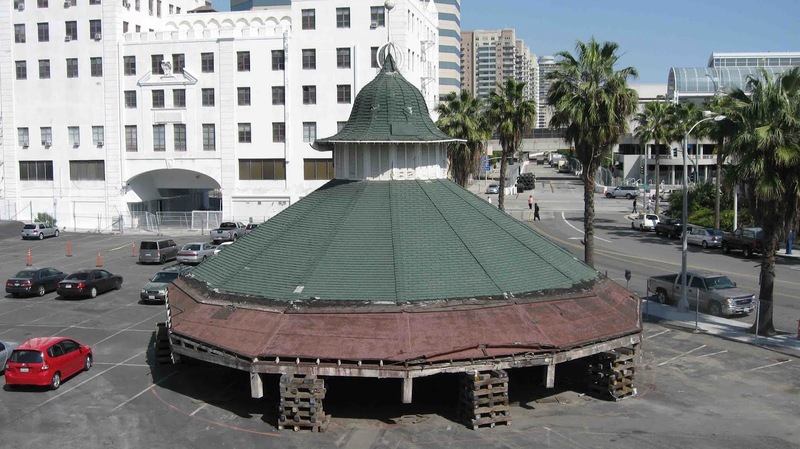 Yes, it is sad that the city of long beach did not care enough preserve a pieace of memory. My sister and I grew up in Paramount Calif in the 60s. We spent many a weekend at the Pike. We once had a contest to see who could ride the Cyclone Racer the most in one day. Well she won 14 to 13. I lost my lunch on number 13. That was a great weekend. Long Beach may have forgotten the Pike but my sister and I never will. What about the accident at the pike why is it covered up, that's the real reason it got shut down. would have been in the mid 1930's to early 1940's. A former co-worker of mine told me the kid's head landed in his aunt's lap. The time frame mentioned makes sense given his age at the time. 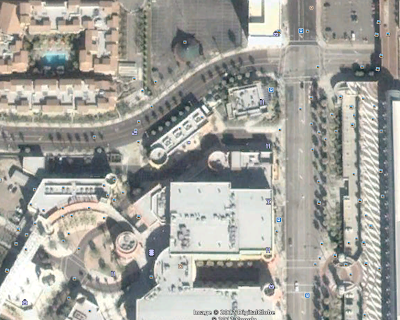 The incident happened in the camelbacks that were under the framework. I remember riding it in 1966 and there were signs everywhere saying DON'T STAND UP! -- one with a skull and crossbones. We grew up going to the Pike, and I remember walking past the corpse of McCurdy in the funhouse, but I've never been able to find any info on the decapitation...cover up?? 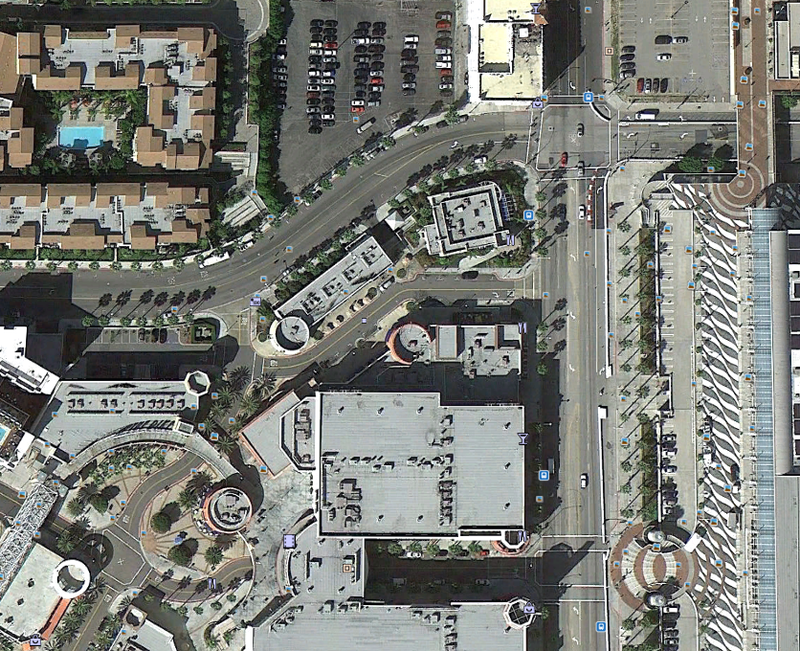 I grew up in Long Beach, California. I was born in 1938. We lived in a large craftsman home part way up Signal Hill. The Pike - The Plunge - The Looff Carousel - Rainbow Pier - Jergens Tunnel - The Pacific Coast Club, The Roller Coaster, and miles of sparkling clean sandy beach, have all changed. I hold these memories dear to my heart. 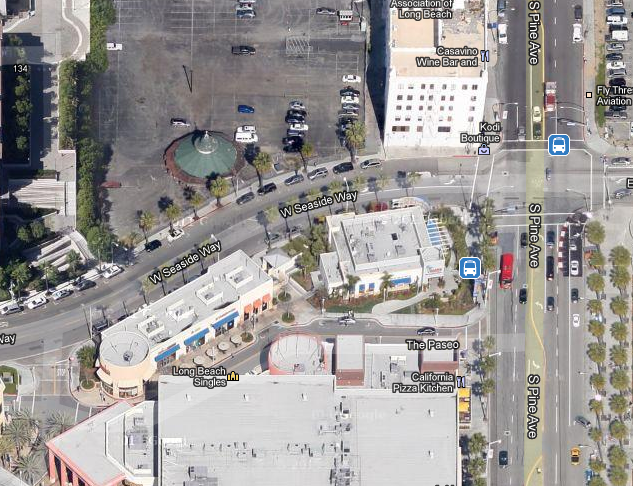 I could walk from our home on Sunrise Blvd. to the beach 2.9 miles away in a little less than an hour. My aunts loved to take me and all my cousins to the Pike and beach for a wonderful days of events. I have visited the new shoreline attractions, and even though they are wonderful, they do not seem real to me. As a child in the 1960's my dad ran the "jones' pony rides" at the pike. I spent my whole summer there with him growing up. The decapitation story was true but happened many, many years prior to the pike ever closing. the Laff in the dark mummy was also a true tale. By the end of the 1970's the city was simply through with the pike and the drug and gang problems it brought. 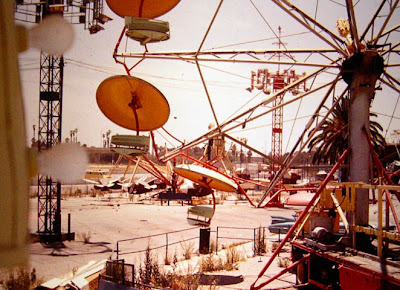 They had no interest in refurbishing it as it's once huge crowds were now going to Disneyland and Knott's. They knew that the ocean front property was a cash cow and they just threw 100 years of history in the garbage can. Many people have many fond memories of The Pike (and Queen's Park). Thank you for this opportunity to share our stories about the Long Beach Pike. Our family business, Creative Amusement Rides designed, built, and managed several rides and parks. Our business partners were Elmer and Curtis Valier, the creators of the double Ferris wheel and many other attractions. Kernel Tom Parker, manager of Elvis at one time worked for the Valier brothers. My father built a surfing ride with dolphin replicas swimming next to you. The snow mobiles was a multi level kiddie ride that ran next to a miniature snow scene and large disco ball representing falling snow. The show mobiles were colorful dune buggies on an oval track. The Rocket ride was one of the largest attractions with the first self supporting roof and spinning fiberglass covers over the sweeps. The "funny jungle" was an animated walk-through attraction of cute wild animals. The electronic shooting gallery was the first of it's kind and state of the art for it's time, It was parted out to several amusement parks and storage facilities when closed. As a little boy I pushed the empty coaster cars to the font of the line to accommodate more ticket sales. My father had me stand behind the TV cameras when the many shows were filmed. We relocated some of our rides and a portion of the shooting gallery to Heritage Square in Colorado when the Pike closed. We also built dark rides at the old towne mall in Torrance and an outdoor dinosaur ride in Colorado, using many parts from the Pike. With regards to the accident on the cyclone racer, my mother told me what happened. A sailor was in a car on one track with his girlfriend while his friend was in a car on the opposite track. The sailor told his girlfriend that he could jump from his car into the other car on the other track. Unfortunately, he didn't make it and died. The people who came up with the two racers going at the same time didn't think anyone would be that stupid to try that stunt. I've always wondered about that accident and how it happened. Thanks for the info. I was about 5 years the first time I went to the Pike. My grandmother, aunt, and mom took my brother and i. Was my first ever carnival ride, and I lost my lunch. Later in the late 50's and early 60's me and some buddies from my ship would spend a day there. We rode the Cyclone over 15 time in a row. Surly will be missed. I feel sorry for kids today. As a kid I heard that some sailors were decapitated when something went wrong with the roller coaster or something the sailor(s) did. I don't think I heard about the 1962 accident. Thanks for the info.